First, thanks to Design and Design for mailing me this book for review. 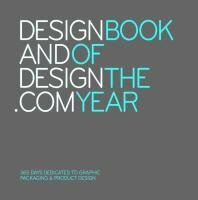 Design and Design is a website that's dedicated to two projects, one in graphic design and the other in product and packaging design. The Book of the Year, volume three now, is their offline extension to bring those inspiring examples in a single book. The book is a 768-page hardcover. Inside, it features on the left-sided pages graphic design and on the right-sided product and packaging examples. The examples look beautiful, classy and modern. The variety is great. They are arranged chronologically as they appeared on the website. At the back is the contact information of the designers should you want to check out more work. It's a good source of inspiration for graphic and product designers. Be sure to check out their website for even more inspiration.